Will compass work in Southern Hemisphere? My wife and I will be going to Patagonia next week for ten days. From there we go to Antarctica for three weeks. Will be doing some hiking but just day stuff. Here is a question for all of you as I can't seem to find a straight answer on the Internet - does a compass work in the southern hemisphere? Will the magnetic needle still point north? This is not a huge issue for me but just wondering. Thanks for your help! I just got back from my five week Patagonia/Antarctica trip last week. Just before leaving for the Antarctica segment of the trip, I did an experiment in the city of Ushuaia which is located on the southern tip of South America. It's latitude 54°48′south. I visited a local park that had a large decorative compass made out of stone. I used it to get my north, south, east, west bearings. Side by side I set up a North American compass, a global compass, and an iPhone compass. All three pointed in the exact same direction - north (see photo below). I mentioned my experiment to a guy I met from Australia. He said, "Of course they pointed north. A compass will point north unless you sitting on the South Pole..." As I mentioned in my previous post, this was not a huge issue for me but it was fun finding out the answer. How do you comment that? Let C, fig. 87, represent a dipping needle on the "equator"
of a globe. A mere inspection of the diagram is sufficient to make it demonstrated that the needle C cannot be horizontal, and at the same time pointing towards the north pole N. If a ship sailed east or west on the equator where the compass is horizontal, it is evident that its north or south end would describe a circle in the heavens equal in magnitude to the circumference of the earth at the equator--as shown by D, E, F.
My point is that there is no south pole whatsoever! Last edited by cikljamas; 05-16-2014 at 07:18 AM. "We saw distinctly, for the first time, the cross of the south, on the nights of the 4th and 5th of July, in the 16th degree of latitude. It was strongly inclined, and appeared from time to time between the clouds. . . . The pleasure felt on discovering the Southern Cross was warmly shared in by such of the crew as had lived in the colonies." was in the 16th latitude south, and then it was "strongly inclined," showing that it was rising in the east, and sharing in the general sweep of the stars from east to west, in common with the whole firmament of stars moving round the pole star of the northern region. We have seen that wherever the motions of the stars are carefully examined, it is found that all are connected, and move in relation to the northern centre of the earth. There is nowhere to be found a "break" in the general connection. Except, indeed, what is called the "proper motion" of certain stars and groups of stars all move in the same general direction, concentric with the north pole, and with velocities increasing with radial distance from it. To remove every possible doubt respecting the motions of the stars from the central north to the most extreme south, a number of special observers, each completely free from the bias of education respecting the supposed rotundity of the earth, might be placed in various southern localities, to observe and record the motions of the well known southern constellation, not in relation to a supposed south pole star, but to the meridian and latitude of each position. This would satisfy a certain number of those who cannot divest themselves of the idea of rotundity, but is not at all necessary for the satisfaction of those who are convinced that the earth is a plane, and that the extreme south is a vast circumference instead of a polar centre. To these the evidence already adduced will be sufficiently demonstrative. line, or plane of latitude, as they would if the earth is a globe. 2nd.--The Southern Cross is not at all times visible from every point of the southern hemisphere, as the "Great Bear" is from every point in the northern, and as both must necessarily and equally be visible if the earth is globular. In reference to the several cases adduced of the Southern Cross not being visible until the observers had arrived in latitudes 8°, 14°, and 16° south, it cannot be said that they might not have cared to look for it, because we are assured that they "had long wished for it," and therefore must have been strictly on the look out as they advanced southwards. And when the traveller Humboldt saw it "the first time" it was "strongly inclined," and therefore low down on the eastern horizon, and therefore previously invisible, simply because it had not yet risen. 3rd.--The earth is a plane, with a northern centre, over which the stars (whether fixed in some peculiar substance or floating in some subtle medium is not yet known) move in concentric courses at different radial distances from the northern centre as far south as and wherever observations have been made. The evidence is the author's own experiments in Great Britain, Ireland, Isle of Man, Isle of Wight, and many other places; the statements of several unbiassed and truthful friends, who have resided in New Zealand, Australia, South Africa, Rio Janeiro, Valparaiso, and other southern localities, and the several incidental statements already quoted. all statements to the contrary are doubtful, inconsistent with known facts, and therefore not admissible as evidence. The Christian Bible (and the Koran!) declare the earth to be motionless. The mathematical Copernican model says the earth rotates on an "axis" (at over 1000 MPH) orbits the sun (at 30 times rifle bullet speed), and is whooshing around a galaxy (at 250 times rifle bullet speed) .....all at the same time. Over the centuries, superstars in the physical sciences established the Copernican model as an unchallenged fact. This success paved the way for conquest of the biological sciences (Darwin et al). This transvaluation of values and philosophy (Nietzsche et al) then quickly spread to the social and behavioral sciences (Marx, Freud et al), to mathematics (Einstein et al), the Arts (Picasso et al), Education (Dewey et al), and so on through today's media reinforcement of all of the above. ..As the 21st Century gets its feet wet, man's "knowledge" is almost totally secularized and the Bible all but ignored as the source of absolute Truth from God Himself. ..The "sciences" reign supreme, and they do so because of the victory of Copernicanism over the Bible's motionless earth. Since flat-earthism is the paradigm of Bible-Science, it should be discussed first. It’s difficult to see how the scientific creationists, some of whom claim to discern the laws of thermodynamics in the Bible, can fail to see its flat-earth implications. EARTH IS STATIONARY ! ! ! "Are there any Earth-is-stationary proofs? ", you might be asking. Yes! -There are quite a few undeniable proofs that the Earth is stationary - that it does not rotate about its axis daily. “The most important element in heliocentric model is the Earth’s rotation about its polar axis”, says Dr. Shaban in his book, The Verses of Deus (page 77). The reason for that is obvious: If the Earth does not rotate 360 degrees in 24 hours, but if it does revolve around the sun, then one side would always be in daylight, while the other half would experience continual night. It would be similar to what we see of the moon, as it revolves around Earth. 3) Similar to points 1 and 2, IF the atmosphere was rotating along with the Earth, it would have to be moving faster at the equator than at any other northern or southern degree of latitude (= distance from the equator). But in fact, the atmosphere does not move – it has the same force (atmospheric pressure) except for relatively small, and predictable, variations based on altitude and temperature. 4) If the Earth was rotating as we are told (i.e., from west to east in direction), an airplane would have to travel much faster to fly from Los Angeles to Miami than from Miami to Los Angeles. And the required speed to fly west-to-east at cities close to the equator would be much greater than speed needed to go from, say, Toronto to Moscow (since the Earth’s speed of rotation closer to the North Pole would be less than farther to the south). He goes on to point out that 2π/T is a constant when Earth rotation is considered, since T = 24 hours. In other words, to be traveling along with the Earth as it rotates around its axis (if it did! ), atmosphere at 500 kilometers would be moving at 500 meters per second (about 1,118 mph). Near sea level, the atmosphere would be traveling at 1670 km/hr, or about 1,037 mph. That is about 81 mph greater. So at 500 km (about 311 miles above sea level) the pressure of the atmosphere (gas) would be greater than at sea level. –It has to be, for, as Dr. Shaban points out, the principle of the centrifuge and the centrifugal pump is the same as would be for a rotating Earth: The greatest pressure is at the farthest point from the center of the rotating body or part. Since we know that actual atmospheric pressure decreases with altitude instead, the Earth cannot be rotating and have the atmosphere we know. Finally, for this page, the gaseous atmosphere, if rotating with the earth, would exhibit properties for which the centrifuge is made: Heavier elements and molecules would be driven outward. That means there would be relatively more oxygen than hydrogen at high altitudes, and more hydrogen than oxygen (by percentages) near sea level. That is because oxygen is heavier than hydrogen. And the result does not agree with reality (that says the percentage of oxygen stays the same with altitude - just the amount decreases). And that would mean that life as we know it on earth would not have survived. But life has survived. So the Earth-is-stationary point is proven! The Earth does not rotate on its polar axis. This stands proven and absolutely destroys the possibility that heliocentricity could be true. -Because if the earth is stationary (in terms of having no rotation) but it did revolve around the sun, one side of the earth would be very hot and the other constantly frozen from lack of sunlight. The earth is not rotating - spinning. Last edited by cikljamas; 05-16-2014 at 09:07 AM. You have to see this, especially pay attention at what has been said in 13th minute of this video (about the true reasons of organizing Second Council of Vatican): Mic'd Up "The Principle: Is Earth Really the Center of the Universe?" The Pope then recalled how they saw "that the relationship between the Church and the modern period was one of some ‘contrasts’ from the outset, starting with the error in the Galileo case, "and the idea was to correct this wrong start "and to find a new relationship between the Church and the best forces in the world, "to open up the future of humanity, to open up to real progress." Now, what Ratzinger really meant by mentioning "THE ERROR IN THE GALILEO CASE"??? If the earths rotation is 24hours and the earth trip around the sun takes 1day then yes it would always have only on side facing the sun but it takes 365.25 days so that isn't an issue. The atmosphere isn't an object. If it were a single object then yes it would try to fly off. HOWEVER! being a mass of unconnected gas it acts as a lubricant deflecting each accelerative impact. according to the "logic" presented oceans should be in the sky as they are denser than air. Gravity out pulls the centrifugal forces at that point. Hot air rises cold air drops due to differences in density Hydrogen fly's skyward at about 15mph from that density difference. I know the earth spins due to one simple test. Pull the plug on your drain and watch which direction the water swirls. If your in the north it will drain counter clockwise, in the south clockwise. As far as the universe having warm and cold areas have you ever considered the expansion of the universe is in the shape of a toroid not a sphere. From our perspective we wouldn't be able to perceive it but it would be like a concussive ring born of a bullets passing. Finding one loose thread doesn't unravel a tapestry. Last edited by Hrothgar; 05-16-2014 at 07:41 PM. What is the point of your first sentence? There is no point in your sentence, but your pointless sentence reminds me to one question that has a great point: in geocentric universe everything is spinning around Earth, how can it be? Do you feel any wiser now? Last edited by cikljamas; 05-16-2014 at 08:34 PM. So where are the edges located and what is at the bottom on the other side? The edges are located in "the south" and "the south" is not the south in ordinary meaning of that word. The south means farther (southerner) from North Pole which is in the central position of the Earth. Despite the obvious sincerity of those who so view the Bible, the inerrancy doctrine has no basis in fact. That the Bible contains mistakes in every area mentioned by Mr. Till is a truth widely recognized by reputable Bible scholars. One of the most consistent scientific errors that Bible writers made concerned their misconception of the earth's shape. In Psalm 24:2, for example, it was said that "the world and all that is in it belong to the Lord; the earth and all who live on it are his. He built it on the deep waters beneath the earth and laid its foundations in the ocean depths," (GNB). ...In both the above experiments it will be seen that the water will be drawn away from the sides representing the shores when it is elevated in the centre. Hence the supposed attraction of the moon upon the waters of the earth could not possibly cause a flood-tide on the shores which are nearest her meridian action, but the very contrary; the waters would recede from the land to supply the pyramid of water formed immediately underneath the moon, and of necessity produce an ebb tide instead of the flood, which the Newtonian theory affirms to be the result. ARK on Mt. Ararat: WHY the media BLACKOUT on the real history of Ararat? So in summary it's not a Dyson sphere, its a Jesus sphere. You must be confused by the position of God on above schematic, aren't you? You can not prove the trueness of any of the first two options, but i can prove to you that the third option is true. 1. Fast moving water can erode away dirt, sand and even rock. When the water slows down, the dirt, sand and rock are dropped. This sediment may contain minerals that can be weathered away quickly. In the San Francisco area of California, beds of sediments hundreds of feet thick contain minerals that would have been destroyed if not buried quickly. Such beds can be seen in many other areas world-wide. These sediments could not have been laid down slowly over thousands of years otherwise the minerals would have been destroyed by weathering. Such beds tell us that a great quantity of water was involved and the sediment was deposited and buried quickly. Now that you see that there is plenty of evidence for Global Great Flood you have to ask yourself if such a global event could be possible on the rotund Earth (Globe), especially rotund and spinning Globe? It is obvious at the first glance that the answer to that question is: NO, IT WOULD NOT BE POSSIBLE! Underlying the flood story in Genesis 6-9 is the ancient Israelite view of the cosmos as made up of a flat disc-shaped earth floating on water. Below the earth were the "waters of chaos", the cosmic sea; the waters were also above the earth, and so the solid bowl of the raqia (firmament) was necessary to keep them from flooding the world. You see: if there was a Global Great Flood, Earth surface has to be Flat!!! But that is just one among innumerable proofs of Earth's Flatness and Motionless!!! If that is still funny to you feel free to laugh, just remember: you were warned about related health issues! Last edited by cikljamas; 05-17-2014 at 04:28 PM. What do you expect to happen if you travel in the same direction? Fall off the edge? You think the moon, sun, planets are all plates? Throw a handful of water into the air...When gravity pulls it back down...it turns into spheres. Planets form into spheres while in their molten state while being pulled in by the suns gravity. Why do bible followers lack logic? Seems like that's a requirement to have "faith". In short, he maintains that the earth is at the center of mass of our universe, and the universe rotates around the earth, analogous to the way a thrown tennis racket rotates around its center of mass. I hope I'm not quoting something already cited in this thread. "Fluid or semi-fluid substances in a state of motion invariably assume the globular form, as instanced in rain, hail, dew, mercury, and melted lead, which, poured from a great height, as in the manufacture of small shot, becomes divided into spherical masses." "There is abundant evidence, from geology, that the earth has been a fluid or semi-fluid mass, and it could not, therefore, continue in a state of motion through space without becoming spherical." In the first place, in reply to the above, it is denied that hail is always globular. On examination immediately after or during a hail-storm, the masses present every variety of form, and very few are found perfectly globular. Rain and dew cannot so well be examined during their fall, but when standing on hard surfaces in minute quantities, they generally appear spherical, a result simply of "attraction of cohesion." The same of mercury; and in reference to the formation of shot, by pouring melted lead from the top of a very high tower into cold water, it is a mistake to suppose that all, or even a large proportion, is converted into truly spherical masses. From twenty to fifty per cent. of the masses formed are very irregular in shape, and have to be returned to the crucible for re-melting. In addition to which it may be remarked, that the tendency in falling fluids to become globular is owing to what, in chemical works, is called "attraction of cohesion" (not "attraction of gravitation "), which is verylimited in its operation. Its action is confined to small quantities of matter. If, in the manufacture of shot, the melted metal is allowed to fall in masses of several ounces or pounds, instead of being divided (by pouring through a sieve or "cullender" with small holes) into particles weighing only a few grains, it will never take a spherical form. Shot of an inch diameter could not be made by this process; bullets of even half an inch can only be made by casting the metal into spherical moulds. In tropical countries the rain, instead of falling in drops, or small globules, often comes down in large irregular masses or gushes, which have no approximation whatever to sphericity. So that it is manifestly unjust to affirm, of large masses like the earth, that which attaches only to minute portions, or a few grains, of matter. Without denying that the earth has been, at some former period, or was, when it first existed, in a pulpy or semi-fluid state, it is requisite to prove beyond all doubt that it has a motion through space, or the conclusion that it is therefore spherical is premature, and very illogical. It should also be proved that it has motion upon axes, or it is equally contrary to every principle of reasoning to affirm that the equatorial is greater than the polar diameter, as the inevitable result of the centrifugal force produced by its axial or diurnal rotation. The assumption of such conditions by Sir Isaac Newton, as we have seen when speaking of the measurement of arcs of the meridian, was contrary to evidence, and led to and maintains a "muddle of mathematics" such as philosophers will, sooner or later, be ashamed of. The whole matter, taken together, entirely fails as an argument for the earth's rotundity. It has been demonstrated that axial and orbital motion do not exist, and, therefore, any argument founded upon and including them as facts is necessarily fallacious. Last edited by cikljamas; 05-17-2014 at 08:00 PM. 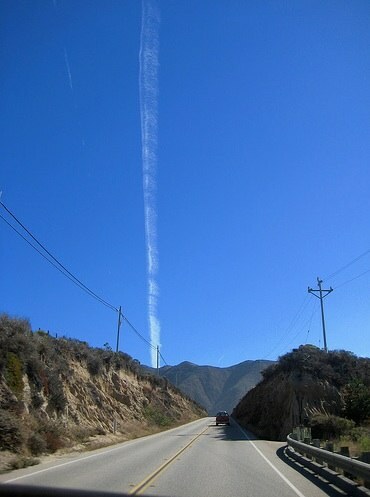 This contrail is no more vertical than the road is, and nor are the power lines at 45 degrees. Everything is horizontal – it’s the just the angle you are viewing it from. All of these show horizontal contrails. Wind resistance will alter the shape of any semi-liquid form being pulled by gravity. Im sure nothing is actually spherical being dropped inside the atmosphere. Probably more oval. If the Earth was rotating fast enough to complete 360 degrees every 24 hours, the atmosphere would long ago have been hurtled away. If an object were dropped from the tip of the atmosphere, it would hit the ground within...lets say...a half hour. That means earth would basically have to rotate 360 degrees within 30 minutes for its centrifugal force to become stronger than gravity and "hurtle away" its own atmosphere. Earth Centrifugal Force is already extremely weak. Then take into consideration, your talking about its affects on the atmosphere (highly energetic gaseous molecules) which is rotating with earth due to viscous drag. Then take into account the mass of gaseous molecules is extremely small. the higher the atmosphere altitude the thinner is gets which means it has less mass...which reduces the angular velocity. So at 500 km (about 311 miles above sea level) the pressure of the atmosphere (gas) would be greater than at sea level....The greatest pressure is at the farthest point from the center of the rotating body or part. Unless that rotating body (atmosphere) is extremely light, exerting very little centrifugal force. Not to mention the higher the altitude, is the less amount of atmosphere above it, which reduces the pressure due to less atmospheric weight above it. No. Gravity is stronger than the centrifugal force. Gravity wins. Oxygen is heavier and naturally settles lower. Throw a water balloon onto a pile of empty balloons. The heavy one sinks. Earth does rotate. Gravity produces a centripetal force which counteracts earths rotational centrifugal force. Its all relative to everything within the earth which makes its interaction hard to measure, even more so for gas particles which practically have no mass. The atmosphere does rotate with the earth at the same speed due to viscous drag. The atmosphere is a gas, which means it does not react to angular velocity, gravity, or centrifugal forces to the same degree as solid mass (like us, or centrifugal pumps) does. "attraction of cohesion" (not "attraction of gravitation "), which is verylimited in its operation. Scale is relative. Larger scale would require more time to attract and cohere. Earth...had millions of years to complete the semi-liquid cohesion. OK im done with the "Flat Earth Theory". Its as real as the tooth fairy. What happens when you get to the edge? Why has no one ever seen the edge? Well, first of all, you have to understand what you are talking about when you use exotic words like "gravity" is. Do you really think you have at least slightest idea of what gravity really represents and/or how it really works? Take the Earth, for instance. Classical physics sees the force of gravity as some type of almost magical attractive force between stars and planets. Ether theory has a totally different view. The reason we fall back to the Earth when we jump up is not this mystical force of gravity, but rather it is because the Earth is constantly absorbing a tremendous amount of ether to keep all of its elementary particles spinning. We are just in the way of this influx. This view explains what gravity is, and also explains Tesla’s seemingly odd statement that the sun is absorbing more energy than it is radiating. The more you think about it, the more this seemingly nutty idea makes perfect sense. The sun requires a gargantuan amount of etheric energy to keep its integrity. If the Earth was rotating as we are told (i.e., from west to east in direction), an airplane would have to travel much faster to fly from Los Angeles to Miami than from Miami to Los Angeles. And the required speed to fly west-to-east at cities close to the equator would be much greater than speed needed to go from, say, Toronto to Moscow (since the Earth’s speed of rotation closer to the North Pole would be less than farther to the south). THE EARTH NO AXIAL OR ORBITAL MOTION. You have to come back if you want to stay alive. What the fictitious “aberration of starlight” de facto shows is the parallax Bradley and Molyneux were searching. But it is a geocentric and not a heliocentric one. Our telescopes actually follow the stars in their courses, all of them depending on, and concordant with that of the sun orbiting the earth. Which sun is at the heart of the stellatum, very slowly precessing around that Great Light. It is this geocentric parallax which allows us to defend and promote a comparatively small universe, dismissing an aberration of starlight which does not exist (see Figure 2). Of triangle S-Earth-M the angle at earth is 41 seconds of arc, and SM = 108 km. By means of triangulation the distance Earth-Star, that is the radius of the Stellatum, can be calculated. It turns out that, on the average, the light of the stars needs 58 days to reach us. One can reconstruct the origin of these numbers by doing a little geometry, starting from a flat earth hypothesis. 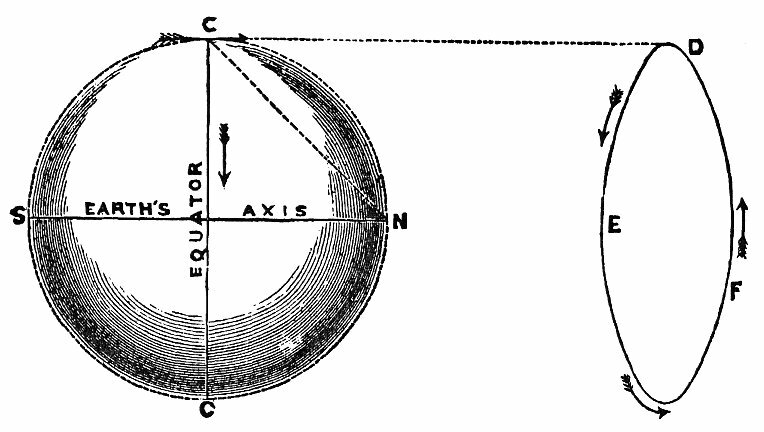 Remember the experiment of Eratosthenes, who measured the angular elevation of the sun at two latitudes in Egypt? He assumed that the sun was effectively infinitely far away (or at least so far compared to the earth's size that the actual distance didn't matter). Then he calculated the diameter of the earth using a second assumption: that the earth was spherical. Last edited by cikljamas; 05-18-2014 at 10:12 AM. Al-Al, you think you can race with me? This is a preconceived notion. @cikljamas, what do you see in the above photo? Al, i didn't say that because i think i am very smart guy, i said that to challenge not just you but everyone who will ever read this thread. In other words i do not think i am very smart guy, i just know i am 100 % right!!! Learn Al, learn: EXAMINATION OF THE SO-CALLED "PROOFS" OF THE EARTH'S ROTUNDITY.--WHY A SHIP'S HULL DISAPPEARS BEFORE THE MAST-HEAD. Let me help you with this little clue: It is about "dipping needle" and my graphic interpretation of needle acting (decreasing/increasing needle angle at different degrees of latitudes) on supposed rotund Earth. Compare it with the diagram (fig. 87.) and related description in the first-opening post of this thread. "The falling of bodies from high places is a further proof of the daily rotation of the earth. By this motion everything upon the earth describes a circle, which is larger in proportion as the object is raised above the surface; and as everything moves round in the same time, the greater the elevation of the object, the faster it will travel; so that the top of a house or hill moves faster than its base. It is found then that when a body descends from a high place, say a few hundred feet, it does not fall exactly beneath the spot it left, but a little to the east .of it. This could not happen unless the earth had a motion from west to east. Were the earth stationary the body would fall immediately under the place it left." The above "argument" for the earth's daily motion ought to be anything but satisfactory, even to its propounders; because it is the reverse of another "argument"--advanced for the same purpose, see page 63; it is not supported by uniform experimental results; the greatest amount of deflection which has ever been observed is a mere trifle compared with that which ought to be found according to the theory of rotation; and, lastly, because special experiment gives evidence directly against the supposition of diurnal motion. IF a ball is allowed to drop from the mast-head of a ship at rest, it will strike the deck at the foot of the mast. If the same experiment is tried with a ship in motion, the same result will follow; because, in the latter case, the ball is acted upon simultaneously by two forces at right angles to each other--one, the momentum given to it by the moving ship in the direction of its own motion; and the other, the force of gravity, the direction of which is at right angles to that of the momentum. The ball being acted upon by the two forces together, will not go in the direction of either, but will take a diagonal course, as shown in the following diagram, fig. 46. It has been argued already (see above quote from the page 63) that a body let fall down a coal pit, or from a high tower, does not deflect, but falls parallel to the side of the pit or tower, on account of the conjoint action of the earth's centrifugal force, and the force of gravity. It is said that at the moment it is liberated, and begins to fall by gravity, it receives an impulse at right angles to gravity, and therefore really falls in a diagonal direction. Thus what is affirmed in one place is contradicted in another! Inconsistency is ever the companion of falsehood. Again, when experiments have been tried, it has been found that a body has sometimes been out of the vertical a little to the east, sometimes to the west and north and south, and sometimes not at all. The amount, when it has been observed, has been very small, very far less than it ought to have been if it had resulted from the earth's rotation. Last edited by cikljamas; 05-19-2014 at 12:29 PM. , i just know i am 100 % right!!! prove that my version is wrong. If the needle is in a horizontal position (since "dipping needle" instrument is kind of a vertical compass) it means that the needle is in a perpendicular or vertical position on it's axis (on it's vertical line). Since the needle is in a horizontal position in "dipping needle" instrument while we are on the equator it seems that the needle points to sky (see figure 87. in the first post), and not towards north magnetic pole. In my diagram you can see where (at what latitude) we should expect needle to be in a horizontal position (perpendicular to the vertical line of a "dipping needle" instrument). Somewhere in north Canada or north Sweden or north Russia, but not on the equator (as it is in reality). In addition, on a globe acting of a "dipping needle" instrument would be in chaotic manner (increasing-decreasing-increasing etc...), but on the flat Earth we would expect linear-gradual-steady-continuous decreasing of the angle (of the needle) as we go away farther from north magnetic pole to south, and vice versa. And that is exactly how dipping needle instrument works. So, where are we? On a globe, or on a plane surface of the Earth? Last edited by cikljamas; 05-19-2014 at 04:51 PM. The discrepancies and anomalies so often observed in pendulum experiments, have led the followers of Newton to seek the desired evidence in measurements of arcs of the meridian; but here again they are even more unfortunate than in their efforts with the pendulum. It is certain that the question when attempted to be answered by such measurements, is less satisfactory than was expected, and in many respects the results are contradictory. How strange it appears, that one of the most ingenious mathematicians the world ever produced, assumed for certain purposes that the earth was a globe, that it revolved, that its revolutions caused the fluid and plastic matter of its substance to determine towards the equator--causing it to "bulge out" to a greater extent than the diameter in the direction of the axis, and therefore the circumference at the equator must be greater than the circumference at right angles, or in the direction of latitude; or, in other words, that the degrees of latitude must diminish towards the poles, and yet "men of the greatest skill," with "instruments of the most perfect construction," having availed themselves of "all that science can do," have succeeded in making measurements the most exact "ever made on the face of the earth," have found results the very reverse of all that the Newtonian theory deemed essential to its consistency and perfection! Instead of the degrees diminishing towards the pole they were found to increase; as if the earth were egg-shaped or prolonged through its axis, and not, like an orange, flattened at the sides--"as if;" to use more scientific language, "the earth were an oblong instead of an oblate spheroid." The fallacy involved in all the attempts to prove the oblate spheroidal form of the earth, is, that the earth is first assumed to be a globe, the celestial surface above it to be concave, and the plumb-lines to be radii. If this were the true condition of things, then all the degrees of latitude would be the same in length; and if the earth were really "flattened at the poles," the degrees would certainly shorten in going from the equator towards the north. If, however, the celestial surface is not concave, but horizontal, two plumb-lines suspended north and south of each other would be parallel, and would indicate equal length in all the degrees of latitude, thereby spewing the earth to be parallel with the celestial surface, and therefore a plane. The differences required by a globe are not found in practice, but such as a plane would produce are invariably found. Hence the failure of geodesy becomes evidence against rotundity, but demonstrating that the earth is parallel to the horizontal heavens, and therefore of mathematical and logical necessity A PLANE. It is ever the case, when falsehood is tested in the crucible of experiment, that its value is diminished or destroyed, whilst the contrary is the case with truth, which, like gold, the more intense the fire of criticism the more brilliant it appears. Last edited by cikljamas; 05-19-2014 at 08:53 PM. changes with the latitude of the observer therefore, this proves that the Earth is almost spherical. We are in 2014., remember, so where is your (at least one) solid proofs of the Earth's rotundity??? You can not have any proof such that, because you should first disprove 1000 irrefutable proofs of the Earth's flatness! I haven't seen any disproof such that, until now. Become famous, and show us your rotund proofs, but reasonable one, not stupid one, that's all i ask of you rotund guys! Is it too much for you? If the answer is "yes" then stay rotund and happy! Last edited by cikljamas; 05-20-2014 at 10:56 AM. By now, you surely have already asked yourself: WHY? So, "hallow earth" hoax theory has been invented with the purpose of covering up the truth that there is no South Pole whatsoever? Admiral Byrd was an active Freemason. He became a member of Federal Lodge No. 1, Washington, D.C. on March 19, 1921 and affiliated with Kane Lodge No. 454, New York City, September 18, 1928. He was a member of National Sojourners Chapter No. 3 at Washington. He and his pilot, Bernt Balchen dropped Masonic flags on the two poles—Balchen also added his Shrine fez. In the Antarctic expedition of 1933-35, 60 of the 82 members were Freemasons and on February 5, 1935 established First Antarctic Lodge No. 777 of New Zealand constitution. Polaris is not visible about 1+23.5degrees below the "edge" of the NH where the "son" points North (bin there done that). fanaticism - definition of fanaticism by the Free Online Dictionary, Thesaurus and Encyclopedia. Last edited by aljhoa; 05-21-2014 at 01:55 AM. and in a similar winter night of New Zealand in the southern hemisphere (right). Click on the constellation icon above the image to see all the labels and constellation lines. At left the Milky Way and the zodiacal light are captured from Sinekci Pass in Toros Mountains of southern Turkey, on the way to Kas by the Mediterranean coast. The right side image is made from Tongariro National Park, the oldest protected area in New Zealand and also a UNESCO World Heritage Site. At a dark site over Lake Rotoaira just south of greater Lake Taupo on New Zealand's North Island, the Milky Way bridges across the southern sky in its all beauty. Our galactic neighbors the Large and Small Magellanic Clouds stands above the southern horizon.